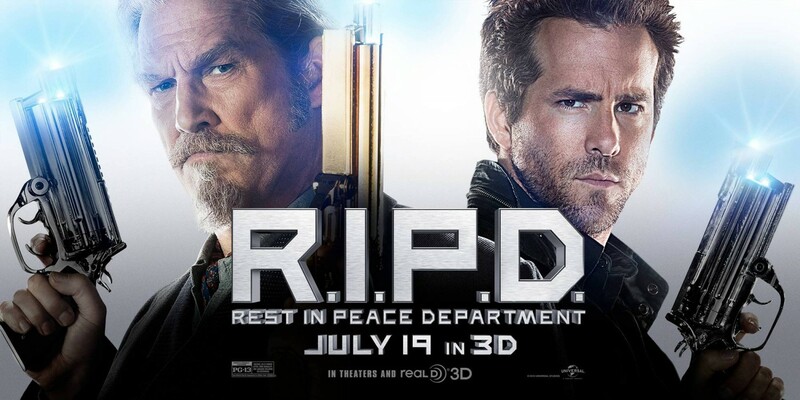 Today’s feature is the 2013 Ryan Reynolds and Jeff Bridges buddy cop flick, R.I.P.D.. The director for the film was Robert Schwentke, whose other credits include RED, Flightplan, and The Time Traveler’s Wife. R.I.P.D. is based on a Dark Horse comic book originally created by Peter Lenkov, who also penned the screenplay for Demolition Man, and has done a fair amount of writing and producing on television. The three other credited writers for the movie were David Dobkin, director of Fred Claus and Wedding Crashers, and the writing duo of Phil Hay and Matt Manfredi, who penned Aeon Flux, The Tuxedo, and Ride Along. The editor for the movie was Mark Helfrich, who also cut Red Dragon, Season of the Witch, Hercules, Rush Hour, Predator, Scary Movie, Showgirls, and Revenge of the Ninja. The score for the film was composed by Christophe Beck, who has provided music for movies like Ant-Man, Get Hard, Frozen, We Are Marshall, and The Tuxedo, among a handful of others. The cinematographer for R.I.P.D. was Alwin H. Küchler, who has shot a batch of other high-profile movies, which includes Steve Jobs, Sunshine, Hanna, and Divergent. The cast for R.I.P.D. is headlined by Jeff Bridges (Hell or High Water, The Big Lebowski, Starman) and Ryan Reynolds (Deadpool, The Voices, Green Lantern), with supporting roles filled in by Kevin Bacon (Cop Car, Tremors, Super, Friday The 13th), Mary-Louise Parker (Weeds, RED, Red Dragon), James Hong (Big Trouble In Little China), and Stephanie Szostak (We Bought A Zoo, Iron Man 3). During a reddit Ask Me Anything thread, Jeff Bridges commented that he enjoyed making R.I.P.D. with the cast and crew, but attributed the film’s ultimate failure to studio interference. Specifically, Bridges stated that “the suits just cut it against the grain, and I thought, screwed it up”. Apparently, Zach Galifianakis was originally cast as Roy Powell (the role eventually taken by Jeff Bridges), but had to drop out due to scheduling conflicts. The reception for the movie was generally negative. It currently hold a user rating of 5.6/10 on IMDb, along with Rotten Tomatoes scores of 13% from critics and 38% from audiences. Financially, it also significantly disappointed: it was made on a production budget of $130 million, on which it only grossed $78.3 million in its worldwide theatrical run. 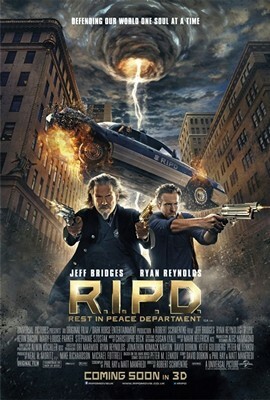 In my opinion, Reynolds and Bridges are both pretty solid in this movie: they are both talented comedic actors, but despite that, they can’t significantly elevate the material that they were given for this flick. That said, they are the sole forces in the movie that make it watchable and entertaining to any degree. Bacon and Parker also fill in good supporting roles, and round out a decent cast. In particular, I have one hell of a soft spot for villainous Bacon. As far as casting goes, I just wish that there was more James Hong, who won my admiration forever with Big Trouble In Little China. As far as negatives go, and there are plenty, the thing that stands out most are the effects. Particularly for 2013, the visual effects are incredibly bad, and I’m not quite sure why. Either corners were cut with the budget, or the project as a whole was dramatically rushed. There are moments where the CGI gave me flashbacks to early 2000s movies like Van Helsing or LXG, which is totally inexcusable for a movie outside of the SyFy Channel. The effects were distracting enough to snap me out of any engagement I had with the story, which was limited to begin with. This brings up another big problem: there isn’t enough time spent in the world created in this movie. The characters never seem to get past the most superficial level of depth, and even the R.I.P.D. institution itself is only shown in passing. Reynolds, who should be the audience’s avatar to the supernatural world, is never properly introduced to his new surroundings, so the audience isn’t either. I understand that the movie wanted to avoid hand-holding, and maintain a chaotic mystique to the world, but the result here is a little too hands-off. There at least needed to be a better establishment of the R.I.P.D. itself early on, much like the Men In Black organization is introduced in that movie. Speaking of which, I think the comparisons to MIB that have often been bandied about when talking about R.I.P.D. aren’t entirely justified. 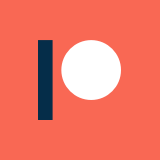 Supernatural initialisms aside, R.I.P.D. is fairly distinct from M.I.B. for a handful of reasons that might not be noticeable at first glance. First and foremost, the central partner relationships in these two movies are quite different. In MIB, Will Smith is a hammy fish-out-of-water who brings most of the comedy to the table via his misunderstandings, mishaps, and unique perspective. Tommy Lee Jones is mostly a stone-faced straight-man, though quite a good one, and his comedy comes from his nonchalance in the fact of absurdity. In R.I.P.D., the duo is only similar to MIB insofar as one is old and experienced, and the other is new to the force. Reynolds’s character is more of the straight half of the duo, and is in many ways bound by his contemporary law training. His comedy, if you can call it that, comes from the frustrations of adapting to a new set of rules and a new, unfamiliar bureaucracy. Bridges plays the ham: though he has tons of experience as an officer, he is still distinctly anachronistic, which is the source of a lot of the humor around his character. He is still casual in the face of absurdity, but it doesn’t define him in the way that it does Jones in MIB. Really, R.I.P.D. is more complicated than MIB in most ways, but certainly not better for it. MIB keeps characters, concepts, and institutions outlandish, but ultimately simple and digestible. R.I.P.D. isn’t good by any stretch: the effects are awful, the dialogue is iffy, and the story isn’t terribly engaging, but it isn’t nearly as bad as I thought it would be from the critical response. The cast really saves it from being an unwatchable disaster, but only just. If you are a Ryan Reynolds or Jeff Bridges fan, you probably wouldn’t regret the time spent watching this flick.